Preparing your own charcuterie can seem like a real handful but in the May issue of Top Billing magazine we show you that preparing your own cured or cooked meats isn’t as intimidating as the name suggests. Our easy cheat’s recipes are just as good as the real thing and are sure to turn ‘that handful’ into delicious mouthfuls. Confit describes a piece of meat cooked in its own fat. 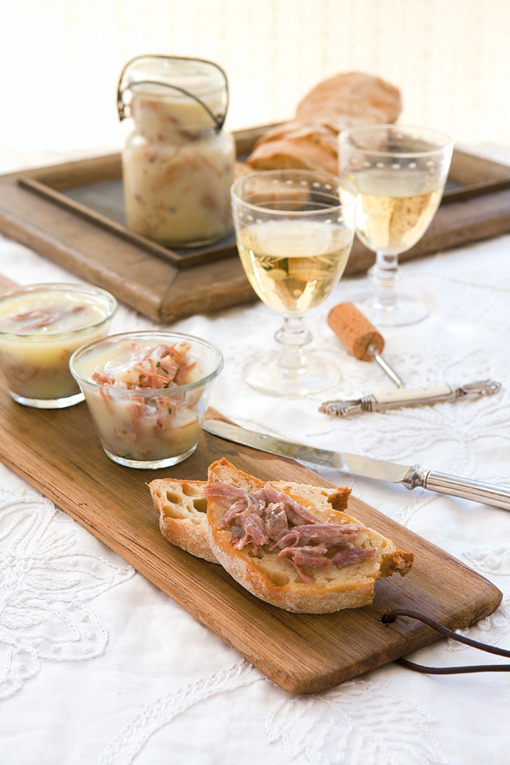 The confit is one of the oldest forms of preserving food and is a speciality in southwestern France. Although it is possible to buy it in tins, making it yourself is very easy. Buy the duck fat at delicatessens. Make sure the duck is thoroughly dry. Place in a bowl and scatter with the salt. Season with black pepper and half of the thyme, bay leaves and garlic or juniper berries. Leave overnight in the refrigerator. Put the duck in a roasting tin, leaving behind the herbs and liquid in the bottom of the bowl. Cover with duck fat and roast for 1 hour at 180˚C. Reduce the heat to 150˚C and cook for another 2 hours until the duck is very well cooked. Transfer the duck to sterilized jars adding the remaining thyme, bay leaves and garlic or juniper berries. Pour the fat from the roasting tin over the duck to cover it completely. Close the lid and leave to cool and for the fat to solidify. The duck confit will keep several months in the in the fridge. To use, remove from the fat and fry until crisp. Serve with lentils or mash. Or use to make rillettes or cassoulet.